It’s always exciting to discover a new burger joint. I love burgers and I love good burgers even more. I knew I was going to be in Scarborough so before I went I googled ‘best burger in Scarborough’ and ploughed through the results. One of the places that showed up was a place that I had never heard of before. It was called Mama’s Boys Burgers. Based on the reviews I read the place sounded awesome. Rave reviews from everyone who had been. Doing my diligent research I saw that they used fresh ground beef ground daily in house. I thought to myself that I had might of just discovered a new favourite, albeit not to close to me but a favourite none the less. It was clear to me that there was nowhere else to go this fine day. When I got there I saw a typical old school burger joint truck stop. You know the type, like Golden Star, Burger Shack, Dairy Freeze, you know, a 60’s style diner. As I walked in I noticed that on Fridays and Saturday’s they are open till 3:00 am, another good sign that the place was going to be great. The place was somewhat busy (and continued to be so as I ate). It took me a moment to order. They had 4 oz burgers, called American or 6 oz burgers called Mama’s. I went for the American Double, 8 oz of beef. I also had the choice of grilled or flat-topped. I chose flat-topped of course as they make for the best burgers, especially when the beef is a fresh never frozen patty. The toppings I would do after it was cooked, a la Harvey’s, and for a side I got the fries, for a drink a can of Coke. As I waited to place my toppings I watched the burger cook in the open grilling area behind the toppings counter. The patties were preformed, not smashed, and there were other things on the flat top such as bacon, souvlaki and gyro’s. After about 6 or 7 my white sesame seed bun was placed down and I picked my toppings. The usual toppings were placed on the bun: lettuce, pickle, onion, tomato, ketchup, mustard. The patties were placed on the burger, it was closed and speared and I got my fries and coke. Digging into the fries I was not so impressed. They were chunky fries but they weren’t crispy enough. They were okay, but nothing out of this world. Not crispy enough, and being chunky the inside was more baked potato than fry tasting. After a couple of fries I rinsed my mouth out with a gulp of coke and admired the burger. Everything looked good, the bun was hefty, strong, dense and had good bounce. The patties, which were a little smaller than the bun looked good. With the two patties the patty to bun ratio was perfect, one patty I believe would leave a fair amount of bun left over at the end. The toppings looked fresh and I was ready to try this great burger. I bit into it and juices poured out of the burger. Well done, juicy, a good texture if maybe a minutely bit tougher than it should be but otherwise so far so good. But something was off here with the taste. It wasn’t the lettuce or tomato which were fresh crisp and ripe. It wasn’t the onion (which I could of used more) and it wasn’t the pickle which was overly vinegary. It wan’t the yellow mustard or the somewhat off tasting Ketchup (it wasn’t Heinz which in my opinion means it is always off tasting). No, it was none of those, it was the actually patties. Within three bites I knew I did not like this burger. These patties tasted almost bad, almost. I could still eat the burger but I really didn’t like it. The patties had a strange taste that I could not place. The patties themselves were just beef with no spices or fillers or anything but they didn’t taste like beef, or at least good beef. Maybe it was the flat-top and all the other things that were cooked on it. Maybe it was bacon I was tasting, maybe it was gyro, or something else. Whatever it was it wasn’t what a burger should taste like. It was close to gross. I wondered if maybe a grilled burger would taste like this too. I wondered if maybe they never clean their flat-top. I wondered what people were eating when they reviewed this burger online. I wondered if maybe it was just this one burger I was eating and if I came again would it still be the same. I wondered lot’s of things as I tried to finish the burger. In the end I didn’t finish it. I had two or three bites left and lots of fries left. I was full though, more so a full from food that I don’t like than a full from overeating felling. This has to be one of the most disappointing burger experiences I ever had. I expected greatness but was served mediocrity. Perhaps if I was to come back it would be a better experience but I don’t think I will be. My first impression was terrible and therefore this review reflects that experience. Even the fries weren’t great . Mama’s Boys Burgers, I’m sorry but you and I can’t be friends. When it comes to this blog and my reviews of all things burgers I generally stick to the strictly burger joints in the GTA. 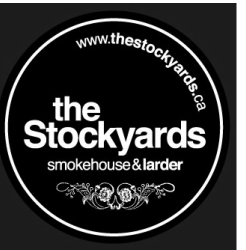 But considering that The Stockyards menu is pretty much 50% burgers and that the burger itself I always considered my favourite I thought it high time I review the burger. As I was in the area during lunch hours on a Sunday I thought I’d pop in and get myself my usual. I parked, I walked over, I saw a huge line. It was 2:00 in the afternoon. I spoke with some folks at the back of the line. They were the last for a table before they closed (and reopened in the evening). I was starving for this burger so take-out it had to be. I squeezed my way into the very small and super packed restaurant and went to the take-out counter. I perused the menu and although I am told that they have the best fried chicken in the city I can never order it because their burger is just that damn good. Of course they have the obligatory speciality burgers on the menu and of course I didn’t order one. Instead I ordered a single patty (I was low on funds) well done with ketchup, mustard and the usual toppings (onions, tomato, lettuce and pickles), topping it all off with fries and a glass bottled Coke. 8 minutes later my food was ready and bagged and off I went to eat it in my car. I took the box out of the bag and opened it to see a burger and hand cut golden fries. I had a few fries, which were excellent (some of the best in the city) and washed it down with a sip of Coke before digging into the burger. Looking at the burger I was disappointed. Why? Because it was a single patty and looked small. It wasn’t that small but I like my doubles. Plus cooked well done it had shrunk in comparison to the bun but it wan’t to off (like at Wahlburgers). A couple pickles, thinly sliced red onions, thinly sliced tomatoes and an assortment of green lettuce’s. A couldn’t admire it to long as I couldn’t wait to eat this burger. Taking the first bite the juices poured out of the burger and landed thankfully in the box. This could be very messy and I could spill everywhere. I savoured the burger in my mouth. My god was it delicious. Griddled to perfection, just enough crust, so juicy, so tender, I was in burger heaven. Usually I eat about half the burger and then return to the fries and go back and forth. This time out I wolfed down the burger in what could only be described as less than a minute. I wanted another one when I was done. I will say that perhaps they put on too much mustard and perhaps the pickles could be less vinegary but regardless this is by far one of the best burgers if not the best burger in the city. There is a reason they always have a line up, there is a reason people talk about the place, the reason is their burgers (and their fried chicken and probably everything else). Is there anything else I could or should say about this burger? Other than next time I am bringing more money as to get the double, no there isn’t. Just go. Go whenever you can. Be prepared to wait for a table or spot at the bar and be prepared to keep coming back. Go. Go now. Go right now. Today fellow readers I will be reviewing BQM. Now this is a tough place to review. Not so much the review but the place. Let me explain. The place is called BQM which stands for one of three things. 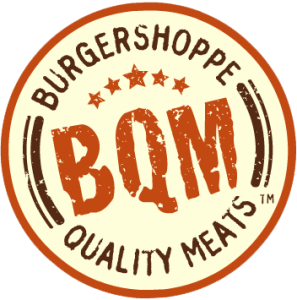 It’s either Burgershoppe Quality Meats, Bear and Quality Meats or Butcher Quality Meats. Do a search on google and you’ll find all three and those who are writing about the place are positive they have the name right. But the hardest thing when it comes to reviewing this burger is choosing the location. They have three locations from what I can see but from what else I can see all three locations are different and perhaps have different menus and ‘quality’. So how do I review this place and have it speak to all the locations and finally which location do I go to? Well what I decided to do is go to one location and review it as though they were the only location. I picked the location on Ossington, which I think is the first location and which I had been to many many years ago. I got in my trusty auto and drove the 45 minutes to get there. I parked on a side street for free parking and walked the 1 minute distance away I was. Entering the front door I had to walk through a dark curtain and into the restaurant. It was very busy, very very busy and I took the last table. I sat and sat and waited and waited. After about 10 minutes the waitress saw me (this is a sit down burger place) came over and apologized saying she didn’t see me. She was pretty, she was nice, I didn’t really mind. Now I would list a few of the specialty burgers at this point or discuss the two choices of beef patty (used to be three) they have on offer and how I wanted to have a double burger with one of each patty but I heard the waitress say it was an old menu that had changed and that there was only one patty that was a combination of both beefs that were offered. So when she came to me and took my order I first asked how much for a double patty (not listed). She said it was four dollars but because she had made me wait she’d not charge me. Fantastic! I made sure the burger was well, that it would have ketchup and mustard (I do that myself I was told), onions, tomato, pickle and lettuce, ordered it with fries and coke and she was on her way. Skip to about 10 minutes later and out comes my burger and fries. I tasted the fries and after two or three of them decided to move onto the burger which means that I wasn’t to happy with the fries. Not that they were bad because it’s hard to make a bad fried potato but they were far from exceptional. So before I bit into the burger I had a look at it. Not much onion, full leaf lettuce, two thinly sliced tomatoes (that I had to move around as they were piled on top of each other and a decent amount of pickles. The patties were griddled and I believe smashed which means they were doing things different from the last time I was there. They were nicely crusted and together they were the perfect size for the sesame seed bun. One patty might of left a bit to much bun by the time you were done. But enough about the look, it’s time to tell you what I thought after I bit into the burger. It was of course a good tasting burger that was juicy and crumbled in my mouth as I ate it. I mean, it was a griddled burger which is the best way to cook a burger in my honest opinion, so how could it not be good? But it wasn’t the best griddled burger I have ever had. Compared to other places that serve this type of burger I found the flavour a bit bland. There was flavour but not much. I could of used more onion to ‘beef’ up the flavour. What flavour was there was tasty but I wanted more. I still liked the burger, it still satisfied my need and urge to eat something so delicious and to be honest it was a lot better than the first time I had been there and at that time I had been disappointed. I wolfed down the burger but with every bite I thought how Burger’s Priest and Holy Chuck and Five Guys and Fresh Burger and The Burgernator did the same but only better. Then when I was about 3/4 of the way through my burger, instead of just crumbling in my mouth the burger patties fell apart in my hands. I had to spend a few minutes putting together the burger again and when that didn’t work I had to somewhat shovel the remaining burger bits into my mouth. So at the end of the day the service was good, the fries okay and the burger was good. Not the best burger, maybe the worst griddled burger I have had yet but still it was griddled and that’s a plus. I’d eat this burger again if I was in the area but if I was at Spadina and Queen I’d go to the Burger’s Priest every time over BQM. Boy do I go on adventures to get burgers, more so since I started this blog. Sometimes they are adventures done by my choosing and sometimes they are adventures that are just out of my control. For this review it was another in a long line of out of control ones. This one started by me going to a movie. After the movie (around midnight) I was starving and thought ‘Why not get a burger?’. Then I thought ‘Why not get a burger you haven’t reviewed and review it?’. Then I thought ‘That’s a good idea’. So I was in Richmond Hill and I was minutes away from Steer Inn Burger thus that’s where I chose to go. I left the theatre and it was cold and miserable and icy. There was lightening in the sky flashing periodically making it look bleak and ominous. I got in my car, warmed it up for a moment and drove off in the direction of Steer Inn, getting hungrier by the second. As I got near it I could see in the distance flashing lights, like there was an accident or something. I got a little closer and noticed that was all the lights I could see. As it turns out the power was knocked out by the crazy winter storm we were in and Steer Inn was closed. Damn it. I had resigned myself to Steer Inn and what was I to do now? It was late and not many places were open. So I decided on A & W on Keele and Highway 7 and I would drive up Rutherford Avenue to Keele in case say Harvey’s or Wendy’s or Dairy Queen were open and then I might have gone to one of those. When I got to Keele and Rutherford low and behold nothing was open because… the power was out! Frustrated but not deterred I made my way to Keele and Highway 7. A & W was there; A & W was open. Now I originally wanted to review A &W by going in and ordering, where I could get a mouthwatering ice cold frosted glass of Root Beer along with my food. Alas, all I could do at this time was drive through. So I drove up to the mic and ordered my meal. Papa Burger combo with fries and Root Beer (not Coke, shocking). I asked for no mayo on my burger and added lettuce. (For those not in the know, the Papa Burger is a double patty). Next I drove to the window, paid, waited a few minutes (maybe three), got my food, drove to the parking area and parked. First thing I did was have a sip of Root Beer. Delicious as always. Next I dug into the fries. Not bad for a fast fast food place. Russet potatoes, thick cut, maybe a tad less crispy on the outside than I like. Still, these fries wouldn’t seem bad if they were on the menu of a sit down semi fancy restaurant. Next up was the burger. I took it out of the bag it was in and removed it from the paper wrapper all A & W burger’s get. Looking over my burger I noticed that I had forgotten to ask for tomatoes, a topping that is a prerequisite for these reviews. Oh well. I decided to continue on in the name of this blog, tomato or no tomato. So the two patties were perfect for the bun, centred perfectly and just the right size with maybe 2 mm of bun poking out around the edges of the patties. The bun was a toasted sesame seed white bread bun. Toasted to perfection, with a crisp outer toasty crust and a soft centre (just how I would of liked the fries). Biting into the burger I was confounded with joy and happiness. A & W has always made a good burger but over the last few years they have made it even better. It was juicy, it was tasty, it was delicious. Even though cooked well done it was the very opposite of dry. For a fast fast food burger it’s texture and taste outdoes anybody else in the game, it’s not chewy or tough or gristly. They cook the plain beef patty on a flattop I believe and sprinkle each side with their A & W seasoning, which is kind of like a cross between Montreal Steak Spice and Cajun Spice. Delicious. Bite after bite confirmed that notion: A & W is delicious. The bun was just the right size and height and had just the right texture. The pickles were just mouthwateringly incredible and I wished I had more to eat on the side. The onions, whole sliced rings, were rich in flavour and perfectly balanced with the rest of the flavours to make an eating experience I never wanted to end. The way the onions were sliced and placed on the burger was great as every bite ended up having a consistent flavour (save of course for the pickles). The lettuce was a large leaf lettuce and added a bit more heft to the burger than would otherwise be there. Now, from what I have said so far this sounds like a burger that would get a perfect review right? Well I cannot do that, I just cannot award A & W a 7 out of 7. It may be an awesome fast fast food burger but it is still just a fast fast food burger. It can be ready in seconds, it could be somewhat pre-cooked, it is not really made to order. It is the best of the bunch (Wendy’s McDonald’s, Harvey’s Burger King) but it really can’t compare to places like Holy Chuck, Five Guy’s and Burger’s Priest. It doesn’t come close to the quality and freshness of say Fresh Burger. It’s real fast food but it’s the best burger you’ll get without having to wait for it to be cooked. So I eat here a lot. I may not of wanted to review A & W this time out but when I bit into the burger all I can say is I wasn’t sorry I was eating it (and I haven’t reviewed Steer Inn yet but I can say from memories past that it doesn’t come close to this burger). So based on how quick you can get the burger, how many locations there are, the quality for a fast fast food place and the fact that the quality remains even though there are so many locations, this is what I ended up giving A & W.
Well, another week or so, another burger place to review. This time out I travelled the very short distance of about 10 kilometres to get to Big Jack’s Burger Shop. Located in Markham, in a stand alone building that used to be a place called Prime Burger, I decided to try this burger for what would be my first time. Now this place is pretty new (no older than a year or just over) and it’s simply designed with simple signage outside and simple decor inside. It’s got steak sandwiches, shakes, poutines, salads, pulled pork and burgers. Like all modern places it’s got a few specialties burgers and plain burgers and build your own burgers. There was one other couple in there when I walked in. So I perused the menu and then placed my order. I ordered a burger with the usual toppings but did not go for the double (I know, I know, I usually do) with fries and a coke. The burger is a fresh made patty and it is ground in house; the fries are homemade; the coke comes in a glass bottle which is also known as the greatest coke ever!! As the cook grilled my burger (not smashed, not griddled) I sat and looked over the menu. Two more couples came in and ordered. Just as my food was ready, which was no more than 7 minutes, another single fella came in. Not a bad crowd for a Saturday at three o’clock-ish; maybe this place was really good? So I get my food and I taste the fries. Really good they were. Really really good. So I continued to eat them up as I examined my burger. Lots of shredded lettuce, not as much onion, thickly sliced deli pickles, tomato slices that were cut to just the right size. The bun was a Dempster’s bun that you can buy at any grocer’s. It’s not a bad bun but it doesn’t strike me as quality for a burger joint. The 6 oz patty looked tasty though and I was ready to munch away at it. With the first bite I tasted something familiar. I couldn’t quite place it so I took another bite. Still no. A third bite and I had it. It tasted like Golden Star’s burger. Very similar but not anywhere near as good. It was juicy but not as juicy. It was a little tougher (but only tough compared to Golden Star). It didn’t seem as big and the beedf didn’t seem as good a quality. I’m sure it was really the same size as Golden Star’s patty but it just looked/felt smaller. Then there were the toppings. Everything was good except the lettuce. Now you are probably wondering ‘How can you go wrong with lettuce?’. Well let me tell you how. You use lettuce that kind of tastes like cabbage. I don’t know why this lettuce tasted like that but it did and it didn’t work for the burger. And as I said earier there was a ton of it on there. It almost ruined this burger, almost. I’m just gonna throw out there real quick how lovely it was washing this all down with an ice cold bottle of Coke. There really is nothing else quite like it. Now back to the burger. When I was done what did I think? How did it rate? Well… I can say that it is not a bad burger, nor is it a great one. It’s a typical middle of the road ‘gourmet burger’ that’s not really so ‘gourmet’ although the pulled pork on the burger and the lamb burger and such are more in line with a gourmet style. But a Dempster’s bun is used for all. It also wasn’t that expensive (although a nearly four dollar surcharge for another beef patty is a bit absurd). I enjoyed the burger, although it wasn’t the best. I enjoyed it but was reminded of Golden Star with every bite and would much rather eat that one. I enjoyed the burger but the lettuce was crap. I enjoyed the burger but it was nothing special. I enjoyed the burger and I might eat it again sometime if I was in the area. I enjoyed the burger but it was just to run of the mill. I enjoyed the burger but how hard is it to make one I wouldn’t enjoy? Not very I would say. It’s a shame as this place has plenty potential. Glass bottle cokes and fantastic fries. Get a better bun, maybe use a bit more tender beef, change that lettuce, make it more unique and you’d have a real winner on your hands. As it is, it gets a pass but it sure didn’t make the cut. The things I do for you my dear readers and followers. I tell you it could be a big pain sometimes but I always follow through. What happened this time? Well, if you remember my last review The Gourmet Burger Company royally pissed me off so I went to Burger Stomper instead. So for this review my anger had dissipated and I decided to go back to finally review their burger. I liked their burger from what I remember and they were one of the first Gourmet burger joints in the city. So I drove out to Parliament to the original location (I think) and guess what? It was closed. Then I went to the location on Adelaide and guess what? It was closed too. I was in traffic, I was driving for a very long time and all for naught. It appears that The Gourmet Burger Co is officially out of business. Kind of sad if you think about it. But I needed a burger, not just ’cause I was in the mood for one and I was starving but for you dear reader, for you. So I took a bearing of my surroundings and decided to go try The Burgernator in Kensington Market. I trekked over to the area and had to circle three times before I found adequate parking. I walked over and walked in to The Burgernator, a place I had never been before. And it was busy, so very busy. Was this due to the fact that it is a good burger or because of it’s location. I was about to find out. I waited in line and ordered my burger. A double ham, pickles, onions, lettuce, tomato, with fries and a can of coke. The ketchup and mustard I do myself. My burger was delivered out to me and the first thing I noticed was that there was no top bun. I asked the guy for one and he gave me look but brought one out for me. After the top bun came I put on the ketchup and mustard and dug into the fries which were good but not great; home cut, nicely fried but I’ve had better. Not to many fries later I looked over my burger. Now the people next to me had delicious looking and large burger patties. That’s what I saw when they were eating. They were gone now so I couldn’t compare but looking at my burger I can say that these patties were tiny. The bun was much larger and the overall ratio, even with two patties was way off. And the lettuce was a very small piece of iceberg and there was one tomato, which was a perfect size for the burger and three pickles. I don’t think there were onions on my burger. Things were not looking good. No top bun, very small patties and too large a bun, no onions, chintz lettuce, perhaps Halal? But then I bit into the burger and everything changed. It was delicious. It was juicy, It was another melt in the mouth fresh burger that could be very addicting. Great texture, great flavour and great quality. So much juice dripped out of this burger as I ate it and it stayed this way the whole time. The flavour reminded me very much of Burger’s Priest and the bun did too. Shockingly and surprisingly there was no bun left when I was done the burger (I did play with the patties to cover the whole bun). I will say that the pickles were weak. They were kind of sweet and overly vinegary and they overpowered the rest of the burger. 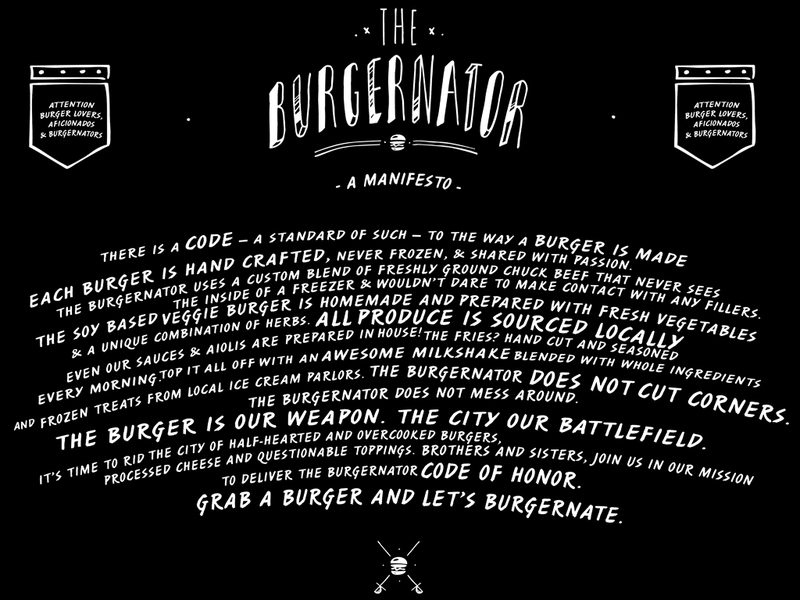 I will also say that if I lived around the corner I would be eating at The Burgernator all the time. But due to its small patties, its not as good as the others fries and its weak pickles and the fact that I have to travel to get there I would choose to eat at other places, such as Burger’s Priest and Holy Chuck and Five Guys. Those places I would and have travelled for. It’s really good but not as good as those places for the reasons I listed. It may taste really good, it may be a bit cheaper than others but in the end I want to be full when I’m done and The Burgernator did not do that. Maybe a triple would do? So for this burger review I decided to go to The Gourmet Burger Company, a place that I’ve been to a few times and is one of the original ‘gourmet’ burger joints in Toronto. I was heading to a friend’s house and decided the Yonge and Eg location would be ideal. I knew where it was so I didn’t bother to map it out. So I’m driving south along Yonge Street and pretty soon I’m approaching Eglinton. ‘Weird’ I thought as I could of sworn it was a little further back. I pull over and map it on my phone and yup, I passed it. So I call the number and an Asian lady answers who speaks no English. I guess it’s closed down; I Guess I’m not going there. Would it be to hard for them to mention this on their website? So I decide to head to the one on Parliament Street, which I believe is the original. I’m fed up though as this is not the first problem I’ve had trying to eat at The Gourmet Burger Company for my review but I do what I must. As I’m heading there I get more and more pissed off about this place so I decide ‘screw that’ and head to the Danforth to try Patty & Frank’s, a place I’ve been wanting to try for over a year. So I’m on Mt. Pleasant when I decide this and I’m driving south. I must turn left on Bloor Street to get to the Danforth. Well low and behold I end up passing Bloor as there is no turn off. My anger grows at this point and only gets stronger as I realize that I am literally less than a minute away from The Gourmet Burger Company by the time I’m almost turned around and heading back to Bloor. So I trudge on to Patty & Frank’s and once on the Danforth, which is where it is located, I get stuck in stand still traffic. Stand still traffic for no reason. Three lights ahead there is no traffic but where I am there is. I grip my steering wheel tighter and continue to trudge forth. Finally I get to Patty and Franks’s and I look in the window to see the lights off and the chairs up. What the hell? Who the hell closes a burger shop on a a Saturday night? So I continue to drive east, smoke fuming from my ears, curse words spouting from my mouth. I want a burger and I want one now. There is no more stand still traffic at least and I’m sailing smooth. So I decide on Burger Stomper, a place I ate at once when it first opened and from what I remember was located a little further ahead. I drive. I drive some more. I keep driving. Where the hell is this place?. So I pull over and map it on my phone; it’s way back near the start of the Danforth. My hairs are on end and my teeth are grinding in anger. So I turn around on side streets and start heading back west on the Danforth. Suddenly I’m stuck in stand still traffic and much like before there is no reason for this. It’s last about 5/10 minutes and then I’m off to the races. I finally get to Burger Stomper but Can’t find a parking spot. I turn on the first street after it and there is no parking there either. In fact there is no parking anywhere. I circle the area three times for a spot and get nothing. This place is jam packed with people or maybe it’s just people’s cars? So I decide to park right in front of Burger Stomper. You can’t park there but I can literally see my car from the window. I park, enter the Stomper and peruse the menu. It’s huge, filled with specialty burgers, sliders and a variety of toppings you can add. Shakes, fries, O rings and such are there as side options. I choose the classic which has a patty, a bun (obviously), ketchup, onion, lettuce and tomato. I ask for pickles, mustard and to make it a combo with fries and a coke (a can). So I sit and wait for my food. I look at the grill, it’s a griddled burger, on a flat top and it looks okay. The last time I was here I thought ‘that was alright but nothing special’. It looked just like I remembered. These patties, as they proudly state, are made with a patented burger press they invented that makes uniform patties that cook perfectly. Whatever? The whole time I’m waiting for my food I am getting up to see if I can see the parking ticket guy coming my way. Nope, he is no where to be seen. So my food comes, after an exceptionally long time. There is a huge order of 8 or 9 people, plus two other orders, in front of me and the ticking of the clock of when the parking ticket guy is coming probably made the time feel even slower. I’ve got my coke, lots of fries and my double burger. As per yush I delved into the fries first but this time I only had one or two before I dug into the burger. The fries tasted alright and they together with the first sip of Coke helped to ease the tension this journey had created. So the burger looked good in front of me. A nice looking bun, good and fresh looking toppings and the patties looked mighty fine as well. Better than from the cooking area. I will say that there was nowhere near enough pickles on my burger and maybe another piece or two of onion could of been good. There was plenty of chopped lettuce though and two slices of perfectly thick and red tomatoes. So I bit into the burger. And you know what I did next? I started to devour it. This burger was amazing tasting. It was cooked perfectly well, with no pink yet it was tasty and juicy and moist. It melted in my mouth as I ate it. It had a great texture and flavour and for all intensive purposes there was a party in my mouth and everyone was having the best of times. I couldn’t stop eating my burger, pausing once or twice for a sip of coke but ignoring the fries completely. So I guess what happened was that my first time at Burger Stomper I did not have the true experience. I don’t know what happened that day but today this burger was magical. It was perfect and oh so good. It was a perfect combination of meat to bun to topping to condiment ratio (short a few pickles though). It was so good it melted in my mouth. It was so good I ignored everything else on my plate. Usually I go back and forth between burger and fires but I just couldn’t stop. After one bite I just wanted another. If this burger was a woman, I’d ask it to marry me. If it were a man, he’d be my best bro. So I’ve got about three bites left of my burger and I look out my window. There I see the dreaded parking ticket guy. I’ve got my burger to finish and all my fries. He’s standing right there using his machine to make a ticket. I rush to get my coat on and grab my belongings while eating through the rest of the burger. I jam the last bite in, grab my Coke and head for the door. I walk up to to the guy, expecting to be handed a ticket but he’s working on the car in front of me first. Thank God! He sees me and says ‘You’re lucky. This is a no parking zone and you didn’t buy a parking ticket.’ ‘Sorry’ I say as he cancels something on the ticket machine thingy. He shakes his head and walks onto the next car. So Burger Stomper, even though I was super angry when I got there, was super rushed as not to get a parking ticket and never got to finish or judge the fries, turned out to be amazing. It was truly exceptional and defied my memories and my expectations. I don’t remember a perfect burger here last time but it was perfect this time and it was so good that all the troubles it took to get there just melted away after bite number one. I can’t wait to go back and eat it again, I just can’t. Hello faithful fellow readers and followers of The Greater Toronto Burger Scene. I have been away for two weeks being sick, lazy and I suppose taking a mini vacation from writing. But I’m back and I’ve got a new burger to review. Today that burger is one that everybody has heard of. 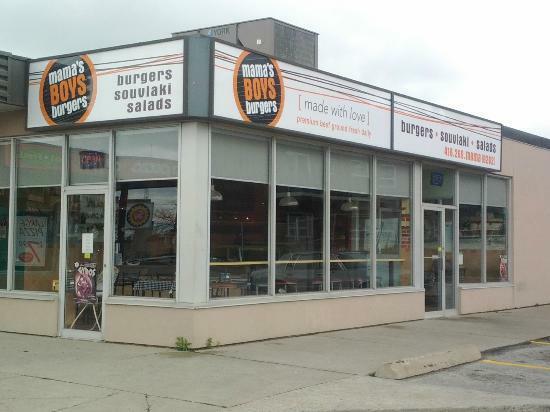 A burger place that is everywhere in the GTA. 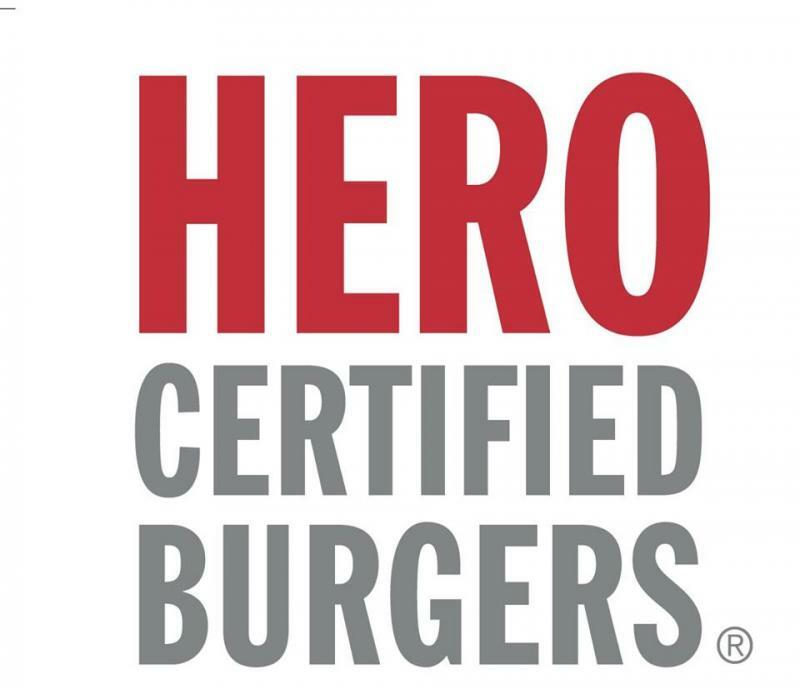 A place called Hero Certified Burgers. I’ve never liked this place and it’s not a place I frequent often (well when I lived near one that was open till four in the morning I used to eat their often enough I suppose) but for the purposes of reviewing all the burger joints in the GTA I figured it was time to head back there. So I popped into my local Hero and perused the menu. They have chicken, salmon and beef burgers. The beef comes in 4, 6 or 8 oz sizes. I walked up to the counter and did my usual. I ordered a 4 oz and asked for a double. The lady behind the counter said I wanted an 8 oz. I said yes but with two 4 oz patties. She said ‘So an 8 oz, that’s how they come’. I said okay and ordered it well done with the usual toppings and fries and a coke. A quick note here for those to be in the know. Hero Burger was one of the first places I knew that had gourmet toppings. Not as many as the newer places but it was unique at the time. Red pepper relish, guacamole, egg, it was different. And in regards to the 8 oz patty, it used to be a single large 8 oz but now they have apparently switched to using two 4 oz ones. Well I’m not going to lie, when I sat down to eat my burger I was excited, more excited than I had first been when I walked in. The switch to two 4 oz patties might make the burger better than I remember. My memories linger on bad tasting 8 oz burgers. Also, over at Tasty Burgers (another burger review site that inspired this one) Hero got 0 stars. I have not read the review yet but based on my past experiences I can see why. So this time I sat with my burger and fries and coke in front of me. Again, as usual I tasted the fries first. Not bad, but not great; thick, somewhat crispy on the outside, soft on the inside. Not the best fries in this style but by far not the worst. Maybe they could of been fried a few seconds longer? Then I bit into the burger. First I’m going to discuss the toppings and the bun. The toppings were great; fresh, ample and flavourful. The pickles were fantastic; the perfect burger pickle experience. The tomatoes were juicy and not to stringy and the onions were robust and yummy. The lettuce was chopped iceberg and to me that is burger lettuce perfection and the bun was great too. It had sesame and poppy seeds, it was perfectly toasted and it was just the right size for the patties. It had a nice texture, it tasted good and it held together as I ate the burger. So far this sounds like a great burger but what makes or breaks a great burger is the patty and in this regard Hero had not changed much. Their patty was and still is terrible. It tastes like a generic frozen patty but I can buy better frozen patties at the grocers. It has a texture more akin to chunky pudding (yuck!) than a beef patty. It is a very juicy patty but in a weird way as it seems to never stop running out of fat to drip onto my tray, paper and jeans. It was so unappealing that I left the last two bites on my tray and chucked them into the garbage. That is something only done when I am too full, I was not too full I had just had enough. I have no idea why this burger chain does so well. I have no idea why they have so many locations. I have no idea why people still insist on eating there when there are so many other choices. I have no idea how it was ever voted best burger. I have no idea why this place still exists. I do know however that I will not be returning. Having watched a bit of the show and being a fan of Mark Wahlberg (his acting) and Donnie Wahlberg (his acting too) I really wanted to try this burger. I waited forever for it to open here and now finally it has. A buddy of mine really wanted to go with me so we trekked down midweek to try out Wahlburgers. 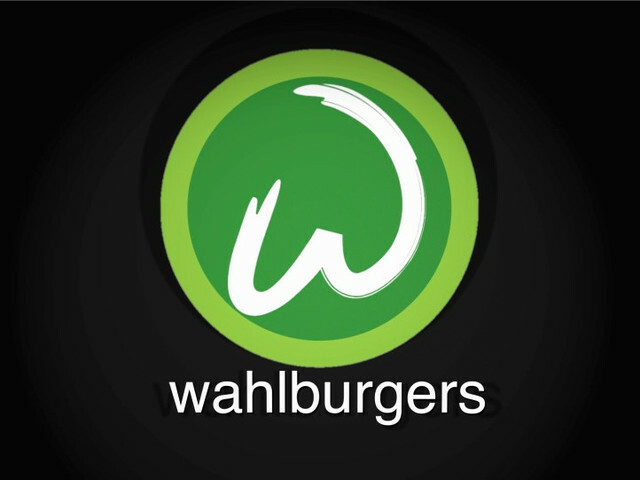 Now if your last name is Wahlburger and you want to open a restaurant you can’t get much better than a burger place as it just makes sense with a name like that. Also, when you are two parts celebrity (out of three) then you have the money to make it look and feel however you want. Whalburgers Toronto is mostly a sit down, get served establishment with a take out section inconveniently located in the back and a sit down area, for the takeout patrons, located upstairs. We chose to do takeout as I was illegally parked and didn’t want to get a ticket. I ordered first. I ordered what they call a double stack (nearly a half pound of meat). Two patties, with the usual toppings, fries and a coke. I asked for no Wahl Sauce and replaced it with ketchup and mustard. My friend ordered the same thing, only he got his as is. I asked how it was cooked and was told well done which was perfect. My friend ordered the onion rings instead of fries. We payed separately; here’s how that went. Me (Reading the board and the prices and making sure of what I ordered or that I was charged the right thing): Wow! Really? What did I just order. My bud’s food came to the same cost. We waited at the counter; it didn’t take that long and when we got it we went upstairs to eat. It was us and staff. We ate, the staff counted money. Now I was not expecting this burger to be the greatest. I wasn’t expecting Boogie Nights, more so I was expecting The Italian Job. In other words I didn’t think it would be an award winning burger but I did think it would be a fun time and half way decent. So I expected The Italian Job and instead I got Planet of the Apes. And by that I mean the burger looked good but when you sat down and ate it it all fell apart. Let’s mention the fries first though. They were pretty bad (well they were okay) but they were generic McCain fries, very generic. My pal’s onion rings weren’t onion rings, they were onion strings and although tasty (the best thing I tried) they belonged as a condiment and not a side. Okay, let’s discuss this burger. I opened my Big Mac style box and saw a glorious looking bun; golden and large and pretty. I touched it. It felt good too. I picked up the burger and took off the top bun to see what I was in for and suddenly things started to look bad. Sure the toppings were fine (the lettuce was not iceberg) but the patties were small. Wait, not small but minuscule. They were like Mcdonald’s patty sized, there was no way in hell that this was almost a half pound of meat. I bit into the burger and more disappointment flooded my way. The patties were okay but they tasted like a generic beef patty. Were these fresh or frozen or pre-made? I could not tell at all (the grill guy was behind a wall so I could not see what he was doing). It wasn’t too dry but it just wasn’t very good, it was passable but that’s about it. That’s the nicest way to say it I guess. There were onions on the burger but I couldn’t taste them. I did see them. The pickles were a bit under pickled, the lettuce was good but had no crispness to it. The mustard was house made and was probably the second best thing about the burger. The best thing was the bun which was moist and delicious and perfectly soft on the inside. It was, though, more than twice the size of the patties I received which makes for a terrible bun to patty ratio. My partner for the day felt differently. He thought it was a great burger. He wanted me to note that his came medium and to him that made all the difference in the world. They accidentally undercooked it medium and he was pleased. As we discussed what he liked and what he didn’t I mentioned how it was no Five Guys. He said it was much better than Five Guys. I almost slapped him, I almost got up and walked out, I almost lost all respect for him. I don’t care that he got the Wahl Sauce and that his burger was cooked medium, there is no way that his burger was better than Five Guys. No f’ing way!! This was the most disappointing burger I’ve had in a while. It was the most expensive burger I have had in years. The quality and the size does not merit almost twenty bucks. This place was a let down and without a coupon I do not think I will be back. One day, in the summer of 2002 or 2003, a friend and I were on the search for something to eat while we killed time waiting for his friend to get home. We were in Mississauga/Etobicoke and were not very familiar with the area. As he was indecisive I suggested a burger and a direction. So we drove the way I chose and eventually we came to corner known as Kipling and Dundas and we saw three places to eat. McDonald’s which was an automatic no, Red Cabin Burgers and a place called Apache Burgers. Apache was on the same side of the street as us so that is where we went. The place was busy, there was a line up; on the wall there were pictures of celebrities who had eaten there. It was first opened up, according to the signage, in 1969 and by the looks of things it had not changed much. It is a typical late 60’s diner/truck-stop/burger pit; neon colours, a few tables, a walk up counter window to pick your toppings. We ordered, we ate, and the rest is history as they say. I loved it and have been back many times since. I have introduced many a person to the establishment and almost everyone agrees that it is dee-lish-ous. Today though was the first time i had been in a long time and the first time since the so called ‘burger revolution of Toronto’ had occurred. I was now used to gourmet, griddled, smashed burgers. How would Apache hold up? So I arrived, and as usual it was packed with nary a table in sight and a long line that stayed the whole time I was there. I ordered the twin, fries and since it was a Pepsi establishment a Dr. Pepper. I had the usual toppings (pickles, onions, tomatoes, lettuce, ketchup, mustard) and a side of BBQ sauce to dip the fries in. The first thing I did when I got my food was delve into the fries. Now Apache always had good fries but they must be doing something different as these fries were not just good but amazing. They were off the hook! They were robust in flavour, crispy on the outside and soft and tender in the middle, thick cut, orgasmic. Paired with the BBQ sauce (homemade and fabulous and even goes good on the burger) I was in fried food heaven. After pulling myself away from the fries it had become time to delve into the burger itself. I hoped it would live up to expectations and memories. After all, this was a frozen burger patty that is grilled on a BBQ style grill. I unwrapped the burger, looked it over, took a sip of the Dr. and took a bite. Right away I was in burger heaven. For a frozen, preformed, grilled, well done patty (actually two of them) it was juicy, moist, tender and oh so yummy. I don’t know where they get there patties from, or if they have them made especially for them, but they sure as hell are damn tasty. And maybe it’s just me but every bite tastes better than the last. The toppings too were fresh and the pickles were what I can only describe as the perfect burger pickle. The bun is a traditional and sturdy white bread bun that holds the just the right size patties in place. 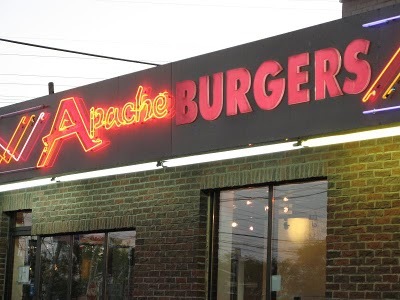 I’ve been to many a place like Apache Burger but they have never been as good. There is a reason why, out of the three places I mentioned earlier, Apache is the only one still standing. This is a place that is quite a drive from my place but it is a drive i will gladly make any day or night of the week, all you have to do is ask. As an added bonus on Thursday’s, Friday’s and Saturday’s it’s open till 3:00 or so in the morning. I love this burger and even though it’s not ‘gourmet’ it still tickles the palette the same way a fine wine would. I’m going to drop it a point because it is a frozen patty but otherwise I highly recommend you try this place. It puts every other ‘frozen’ burger to shame. Yes… Every! Single! One!